Preparing for the arrival of Lewis Nico practices their rendition of Sonny and Chers I got you babe. Or more likely the McCartney/Wonder duet, Ebony & Ivory. Hit me Buemi one more time? where can I find a vehicle like that? Tell me, where can I find a vehicle like that? As I'm a Shadows fan, I really wanted an electric guitar. But dad thought KERS on a car was bad enough. 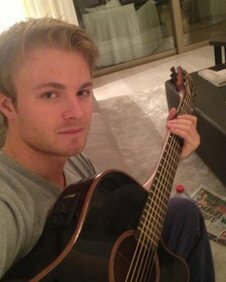 My heart will go on and on"
Nico Rosberg looks into the camera while holding a guitar. I don't know how to play this thing but it'll make for a great profile pic. "Hey Lewis why don't you join me in a rendition of the Kinks' 'Dead End Street'?" "This will look great on myspace, jarr?" Nico: Must be my back-up singer!!!!!!!!!! This is for you Kiki. What if he joined Red bull alongside Seb or Ferrari with Nando. The CD will include all the greatest hits from both including JV's "I was a champion once" and "Downfall", as well as NR's "Champion wannabe", "Mercedes Dream", "Beating the Legend", "My first time on the highest step" and "If only I had a moustache like my old man". But there is more! If you order now, you will receive Rihanna's "Shut up and drive" bonus single for free! And if you are 1 of the 100 callers, you will also receive a CD single titled "Nice Try, Marco Andretti". He is welcome at Red Bull, Ferrari can't have him. Actually I want him to replace Kimi when Kimi replaces Mark.
" First i'll get Lewis over to teach me guitar, we'll have a few drinks, a few laughs then i'll hit him with the "Naked man". What better way to declare my love"
Lets play musical chairs. When I stop playing all the Technical directors find a seat.